In September of 2012 Jeff Cutler accepted a National Urban Design Award of Merit at the IDEX conference in Toronto. The Award was in the Civic Design Project category. The National Urban Design Awards are awarded bi annually recognizing the important role urban design and architectural excellence play in maintaining and enhancing the quality of life in Canadian cities. The Urban Design Awards program has been established to recognize individuals, organizations, firms and projects that have contributed to the quality of life in our Canadian cities and their sustainability. The awards are organized cooperatively between Architecture Canada-RAIC, the Canadian Institute of Planners and the Canadian Society of Landscape Architects in cooperation with Canadian municipalities. Oppenheimer Park was recently featured in the August 2012 issue of Canadian Architect Magazine. The article written by Tanya Southcott provides some insight into the history of Oppenheimer Park and describes the new Park and Activity House design. This project had a strong community focus and we are proud to be a part of this unique place. 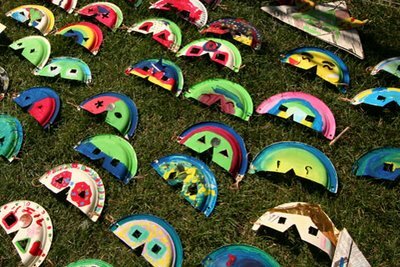 Paige Johnson from the playscapes blog asked us to prepare something for her readers in honour of Aldo Van Eyck's birthday (an event she commemorates every year). She said that people were particularly interested in how to work with topography. As a result we prepared this grading "cheat sheet" to give some direction for prospective DIY playground builders. We also included a list of some good planting options to enhance the play experience. It was announced today that space2place has been honoured with two CSLA awards. Garden City Play environment was recognized with a National Merit Award and the plan the for City of North Vancouver Spirit Trail was recognized with a Regional Honour Award. These awards are in addition to the Design Exchange awards we won for these projects last November. We are excited that our work is being recognized and enjoyed by the public. We hope to continue to build on this success with more great projects. Last year there majority of the winners were in Western Canada. It appears that this year the focus has swung back to the East. The caliber of the winning projects is very high this year and we are honoured to be considered among such a distinguished group of winning firms. Congratulations to all of the winners. Below is a short video illustrating some of the play experiences at Garden City. The video focuses on the activities or "stories" taking place in the park. This is our first video and apart from a few sound issues I think it is successful in displaying another side to the project online. This also shows the park mostly complete with the recent planting in the park. I anticipate the park will change as the planting grows throughout the summer. Look for more videos about our work to be posted here. Garden City Play Environment - Opening Day - June 2008 from space2place on Vimeo. 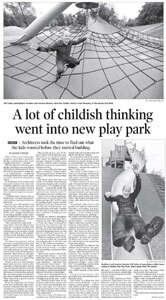 Last Friday (June 13, 2008) the Vancouver Sun published an article profiling space2place. The article is framed around the Garden City play environment but also provides a look at how we approach our work. This is a short interview with Marcie Gray from CBC Almanac in British Columbia at the Garden City Play environment. Unfortunately it was raining when at the park during the interview so there weren't many kids at the park. However, she brought her kids along who to be enjoying themselves. Our Garden city park is opening this Saturday with an official opening from 11:30am - 1pm. The seems be quite a bit of excitement surrounding the park and the park is receiving a lot of media coverage. We are hopeful that this will help to encourage support for more innovative public spaces throughout the lower mainland. This segment aired on Shaw Access early in May. They did a nice job of framing some of the conceptual ideas and research that went into the creation of the park. Garden City - shaw segment - May 2008 from space2place on Vimeo. This segment aired on CTV and features an interview with Alexa. I like how the contrast a "traditional" playground with the new park. Garden City - CTV news segment May 2008 from space2place on Vimeo. The last video aired on CBC. This video features Clarence Sihoe the project manager from the city of Richmond. This video has a slightly different perspective and focuses on some of the natural elements of the park. garden city - CBC news segment - may 2008 from space2place on Vimeo. The construction of the Garden City "green heart discovery park" is coming along nicely. The overall structure of the park is roughed out and the scale of the park feels right. It is exciting to see it take shape. The first concrete pour is scheduled for next week, which is the next important step towards completion. This past week was eventful because the old growth feature stumps we delivered to the site, and they look fantastic. The biggest one weighs 12,000 lbs! You can see how big they are in comparison to the people in the pictures. Though you don't get a true sense of them until you see them in person. It looks like we are headed toward a completion date somewhere around the end of October. 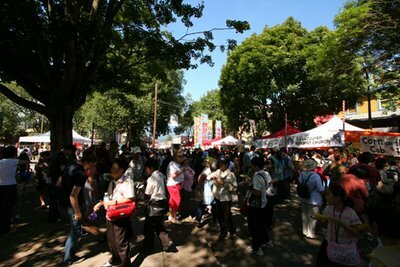 This past weekend oppenheimer park hosted the Powell Street Festival. 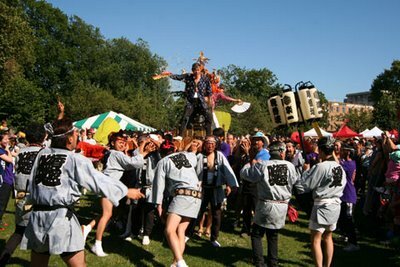 This is an annual Japanese Festival that is the largest festival of its kink in Canada and the longest running community arts festival in the Lower Mainland. I have been to past festivals and this looked to be the most successful yet! Representatives from the Powell Street Festival are on the working committee for the new park. It is exciting to see the park transform for the weekend. This park is probably one of the most intensively used park in the city and obviously plays an important role for many cultures. 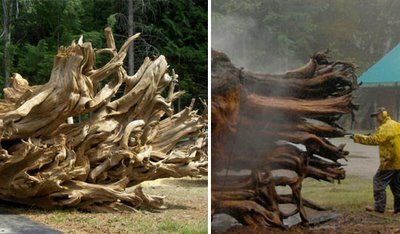 Today Warren from Coastal Cedar Creations sent through som exciting progress photos of the wildwood features for Garden City Park. These pieces are key design components in the park and will add unique play experiences for the children. Warren salvaged this large old growth stump from a cut block near Squamish. Needless to say the effort to salvage this was considerable. However, we are thrilled to have this in the park. We will post more update photos as the construction progresses. Yesterday, we facilitated a series of design workshops at Anderson Elementary School. We had the students design their ideal play environments. It was refreshing to work with them and see their enthusiasm for design. These workshops are the initiation of the design process for a play environment for the City of Richmond. The city recognized that playgrounds have progressively evolved to the point where they have become predictable and too similar from park to park. A goal of our design for this project is to bring the fun back to children's parks and design a park that has a wider range of experiences. Now its up to us to pull these ideas together to create something unique for the city and community.